So unless you want to drive your car off the cliff on your way to visit the golden baby of the Italian Riviera, Cinque Terre, you should really consider reading this guide. Just kidding about the car thing. Or maybe a little true. If you have ever driven there, you know what I am talking about. Reasoning: To be honest, it's pretty much impossible to be alone in Cinque Terre. Unless you avoid traveling in the high peak summer months which will lower a number of people slightly but not completely, or rent a boat, you are going to have to squeeze through crowds of people everywhere you are walking. BUT it is incredibly beautiful and the food is amazing. It might actually be worth it for the seafood pasta on its own. There are five ways to move through the five different villages, Riomaggiore, Manarola, Corniglia, Vernazza, and Monterosso. Option #1 - Train. There's a train that goes through all five villages along the Riviera. I didn't personally do this one, but I did see people come out of the train and the stop and it looked like it was one crowdy and sweaty train ride! But if you don't mind playing sardines with strangers then this is probably your easiest way to go. Just jump on and off the different stops. And also another swim spot. Option #2 - Car. You want to make sure you trust yourself as a driver or trust whoever is driving you. The roads that are nestled through the coast are super narrow! The majority of the time you can only fit one car. The tricky part is that people are driving from both directions so you are going to have to do a lot of stopping, backing and trying to squeeze your car on the edge of the cliff or against the side of the road as you try to maneuver with the other car. The scary part is that the Italians drive like they are stuntmen or like they enjoy playing Russian roulette with their lives so they will drive really fast. The upside is that they are used to these roads so they are (usually) good at hitting the breaks in the sharp curves and delegate the whole squeeze by car event. Also, don't expect this to take 20 minutes. Just driving to one of the villages can take you anything between an hour to two hours in the same driving conditions just mentioned. Just a heads up. Option #3 - Bus. Believe it or not. Even with the insanely narrow streets, they do offer bus rides that will take tourists up and down the villages. I did witness a bus having to back all the way down because of an expecting car from the other direction and it did not look fun. The perk is that you are not driving so you can just sit back and close your eyes, or I don't know, listen to your favorite podcast. Option #4 - Hike. Yes, you can actually hike through villages. Just how the train moves through along the coast, there's also a hiking trail where you can do the same. But on your feet. Option #5 - Boat. I saved this one for last because this is the option I will go with next time I visit. I love how it allows you to be alone as much as you want/need and you can see the villages from the front. Also, you can get off the boat to explore, grab a bite and then get back to your boat again when you are done with people. Score. 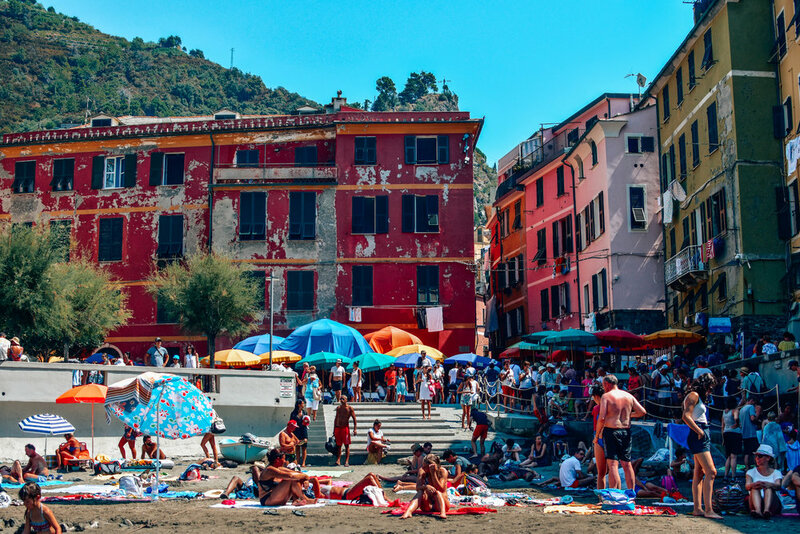 I made this guide about Cinque Terre solely focused on how to get there because that's what I wish I knew before going and NO GUIDES ever talked about it! And there's really no need to plan ahead on where to eat and what to do. The villages are very small and they all have fantastic restaurants, cafes and little stores within a very small radius. You can't go wrong. Unless you forget to order the seafood pasta, then you failed. My travel partner and I.